An action in a small park throws a match at a country's tinderbox of fury. Gezi Park is one of the last green spaces in the heart of Istanbul, an international metropolis of 14-16 million residents. In the intense summer heat, Gezi Park provides an oasis of calm where young couples picnic on the grass, families snack on simit (Turkish pretzels) and ice cream, backgammon players and tea drinkers perch on stools at low tables, and homeless people shelter under the trees. In the past several years I have spent considerable time in the city, living for a while at the corner of Taksim Square, facing Gezi Park. This spring, this public space used by so many of Istanbul’s residents and visitors was slated for demolition by a government intent on urban redevelopment. Giant trucks began taking bites out of the 9-acre park, knocking down trees. “The government wanted to build a shopping mall on the only public green space left in Beyoğlu,” wrote my friend Cağla (“chala”) Arslan from Istanbul. Cağla was a classmate of mine at the London School of Economics. She now works as a trade officer in a foreign consulate in Istanbul. “A park doesn’t make as much money as a new mall,” she said. On May 27th, a small group of activists formed a human barrier to prevent the destruction of the park. Using their shields and the first sprays of tear gas, riot police removed the activists from the park. Word of the destruction and police response spread throughout the city. In short order tens of thousands of people filled the small green spaces bordered by orderly pathways leading to a circular fountain. The gathering had a festive air, with speeches, singing and dancing. Many children and elderly were present in the park. People brought tents and stayed overnight to prevent demolition under cover of darkness. Plainclothes police who had infiltrated the protest set fire to the tents. What started as a protest for a couple of trees soon turned into something much bigger; it turned into a call for democracy, and women’s, gay, and animal rights… In short, it was a public not fueled by any political party or leader. We united under a single slogan: that we wanted to be heard and we wanted to have a say. It was unprecedented. 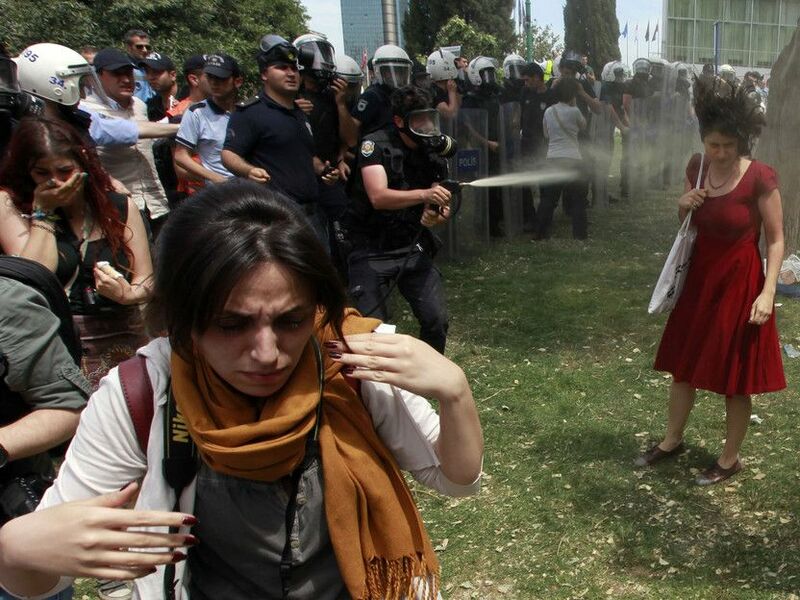 The protests and police retaliation that transpired this summer in Gezi Park and that are still occurring across Turkey today indicate deep societal fractures in the country. 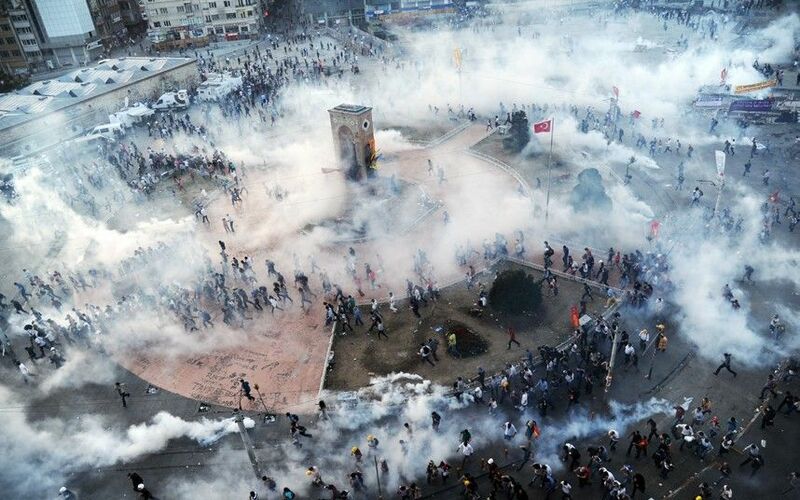 In the early hours of the morning of May 30th, while those gathered in Gezi Park were still sleeping, riot police in gleaming white helmets and dark blue flak jackets used tear gas and water cannons to evict the protestors. People fled their tents. Plainclothes police who had infiltrated the protest set fire to the tents. Before my first trip to Turkey in 2010, I imagined an “Istanbul of the mind” made up of 16th century mosques and 19th century palaces. I did not expect the gleaming towers, steel and glass of the 21st century. Everywhere in Istanbul today one sees the cranes and scaffolding of construction and urban renewal. “There is no place to breathe,” says Cağla. 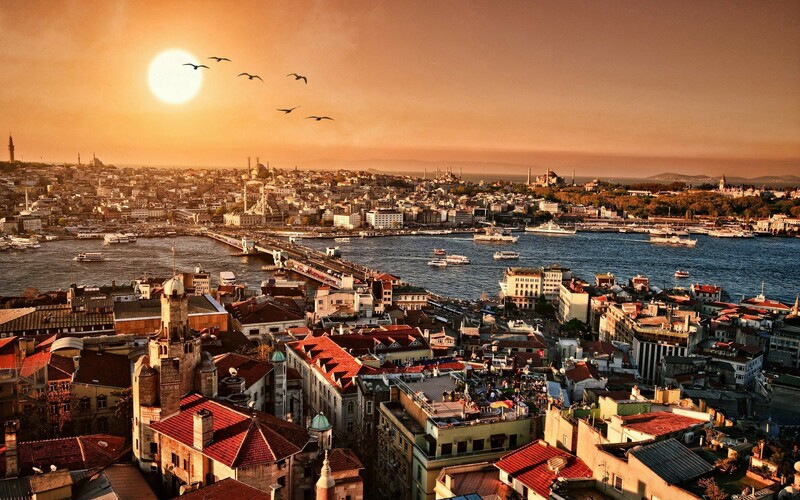 Istanbul is one of the most naturally beautiful cities in the world. Located at the confluence of three waterways (the Bosphorus Strait, the Sea of Marmara and the Golden Horn inlet), the city bridges the continental divide between Europe and Asia. This city of seven hills is composed of many diverse and vibrant neighborhoods. Across the Golden Horn from the legendary Aya Sofia and Topkapi Palace, the heart of the modern European side is Taksim Square. A nondescript square, bounded by luxury hotels, the streets and passageways branching off the square lead visitors into the narrow twisting alleys of historic neighborhoods. Wandering the cobbled streets, stray cats and dogs underfoot, one sees Turks of all colors, sizes and ages; women in all styles of dress – from short shorts and tight jeans to headscarves and full burkhas (I only saw a handful of Turkish women fully covered, the majority in burkhas were Saudi tourists on holiday). Istiklal Street, a pedestrian shopping thoroughfare across the square from Gezi Park, and a main site of the protests, regularly draws tens of thousands of people out on a Friday or Saturday night. It is not just about a park but about living like humans. The strategic importance of Turkey to the West cannot be underestimated. With the second largest army in NATO, Turkey is a historic ally whose concerns merit Western attention and respect. Turkey has absorbed almost half a million refugees from the crisis in Syria next door and is a leading proponent of a heavier response to the Assad regime. Its concerns over the Syrian civil war have led to the deployment of NATO Patriot missiles along the Turkish-Syria border to protect the Turkish heartland. For decades the country has sought to join the European Union and in 1996 Turkey and the EU established a Customs Union to reduce trade tariffs. Full accession, however, has been blocked by several member states including Cyprus and France. The recent failed Turkish bid to host the 2020 Olympic Games is indicative of the government’s attempt to elevate Turkey’s position on the world stage. Instead, the government has fallen into a pattern of undermining its ambitions as a model secular democracy – illustrated by its handling of the protests. Atatürk and Erdoğan. Photo credit: Getty. The government’s controversial plans for Istanbul include building a third bridge over the Bosphorus Strait, at a potential cost of $6 billion; a shipping canal across the Bosphorus to rival Panama and Suez; and a third airport with an intended 150 million annual passenger capacity. An 8.5-mile rail tunnel buried 200 feet under the Bosphorus seabed linking Europe and Asia opened at the end of October, coinciding with the 90th anniversary of the founding of the Turkish Republic. Developed without input from residents or any sort of public accountability, such projects are intended for the benefit of a specific segment of the population.
. . . he sparked the embers into a raging fire of mass protests uniting people across a broad range of political and social groups. Prime Minister Recep Tayyip Erdoğan has taken the brunt of the protestors’ ire. At 59, with graying hair and a smooth face save for a short mustache, Erdoğan carries himself with an air of vigor. With a deep voice and aggressive speaking style he projects the image of a strongman leader. Raised in an observant Muslim household, his political career began with Islamic parties that were banned in the 1990s. He served as mayor of Istanbul from 1994 to 1998 before being jailed for four months for reading a poem that incited religious and racial hatred. A canny politician, he has manipulated the Turkish system of government to his advantage. As mayor of Istanbul, Erdoğan proposed tearing down Gezi Park to rebuild an Ottoman artillery barracks, but was denied by the federal government. Now, with a parliamentary majority, he has sought to fulfill this plan. Nightly clashes between protestors and police continued as members of the city’s three football fan clubs (Beşiktaş, Fenerbahçe, Galatasaray), normally bitter adversaries, joined the protest movement under the banner “Istanbul United.” That the protests could bring together the fiercest of rival football hooligans in a common cause speaks to the passion behind the demands for democracy and freedom of expression in Turkey, or at least simmering anti-government sentiment. Five young protestors lost their lives. And many people were seriously injured because of police brutality. I sincerely hope that the spirit of the Gezi days will persevere, that it will be reflected in the upcoming elections so that those young kids did not die in vain. So that we can see a more democratic country where we can express ourselves freely without the impending fear of being fired [upon], fined or imprisoned. The opposition expanded to other cities with the same brutal police reaction. The most striking thing for me was the police brutality and the fact that people went out on the streets [of] their own will without any call from any organization or political party, especially at the beginning…Social media was one of the key elements. I loved the spontaneous burst in other words. Of course the pro-government media tries to show the protestors as marginalised groups. I’m not surprised. There is massive media disinformation in which AKP supporters are told that the protesters are controlled by foreign powers called the ‘Interest Group’ who are jealous of how well the Turkish economy is doing, and the position it occupies in the Middle East. Reporters Without Borders has ranked Turkey 154th in the World Press Freedom Index, behind Russia, DR Congo and Iraq. Journalists are intimidated and sometimes attacked, as they were during the course of this summer’s protests. According to the Turkish Union of Journalists, 22 journalists were fired and 37 forced to resign for covering the protests. Bianet, one of the few independent Turkish news outlets, reported: “During the Gezi Resistance, 105 journalists have been assaulted, 28 detained and 2 sent to prison.”[iv] Erdoğan has broadened the scale and scope of his censorship rampage, threatening to sue the Times of London for printing in an ad space a letter condemning Erdoğan’s ‘dictatorial rule,’ signed by international celebrities including Susan Sarandon and Sean Penn. The New York-based Committee to Protect Journalists has denounced Turkey as “the world’s worst jailer” of journalists, beating out China and Iran. [v] Speaking at the London School of Economics in spring 2012 Egemen Bağış, Turkish Minister for EU Affairs was asked about the number of jailed journalists. Brash and aggressive, he replied that the journalists in Turkish jails (many of whom are Kurds) are incarcerated not because they are journalists, but because they are rapists, arsonists and murderers, and that they had committed crimes for which they were being duly and justly punished. While this may be true for a handful of them, human rights organizations such as Amnesty International have repeatedly brought the issue to international attention, defending the legitimate status of the imprisoned journalists. Yavuz Baydar, ombudsman of the former opposition paper Sabah (now controlled by Erdoğan’s son-in-law) was forced out of his position for his coverage of the protests. In a New York Times op-ed piece that enraged the government, he argues the media barons are undermining Turkish democracy. One only has to follow the money to understand why. Media censorship in Turkey is systemic – an endemic condition of rapid economic growth and an embrace of the neo-liberal Washington Consensus model. As the Turkish economy grows, new and existing corporations expand, increasing their share of different sectors. Conglomerates operating in telecommunications, banking, construction, and other infrastructure sectors own many of the large media companies, leading to a conflict of interest where objective journalism is the goal. Fearing the loss of lucrative government contracts in other sectors, moguls shut down their own media, preventing investigations, pulling stories and firing editors and journalists. The oligarchs have seen what happens to those who do not fall in line. In 2009, the government levied a $2.5 billion fine for alleged tax offences against the Doğan media group, publishers of the leading Hurriyet Daily News. This July, in the midst of the public unrest, tax auditors raided Koç, another major family-based industrial conglomerate, whose holdings account for 10% of the Turkish economy. In a circus of the bizarre, the government has threatened criminal action against the luxury Divan Hotel in Taksim Square for sheltering protesters and providing emergency medical aid to those tear gassed. The Divan Hotel is owned by the Koç family. When looking at the recent turbulence in the region – the ongoing civil war next door in Syria, the aftermath of the Arab Spring, and the overthrow of Morsi in Egypt – one might expect the Turkish army to step in. Historically, the armed forces have seen themselves as the defenders of the secular Turkish Republic formed by Kemal Atatürk in 1923, leading to military coups in 1960, 1971 and 1980. It is perhaps ironic that the government threatened to call in the army to suppress the current protests. Having dismantled the top leadership of each branch of the armed forces through a series of conspiracy trials, the armed forces appear to be firmly under Erdoğan’s control. Mustafa Kemal, an Ottoman military officer, who came to be known as Atatürk, or Father of the Turks, is revered throughout Turkey as a national hero. Kemal ruled Turkey as President from its founding as a Republic in 1923 until his death in 1938. Determined to bring Turkey into the 20th century, Kemal enforced a modern, secular and Western vision for the country, known as Kemalism, with such measures as outlawing the fez and giving the country six months to convert the language from Ottoman Arabic script to modern Turkish using the Roman alphabet. For all his reforms, Atatürk was an authoritarian ruler. Seventy-five years after his death, the face of the founding father of the Turkish Republic is everywhere: on T-shirts and flags, on banners and posters, on restaurant and living room walls. A massive print of his face hangs on the Atatürk Cultural Center in Taksim Square, another target for redevelopment. Many protestors waved the Turkish flag bearing Atatürk’s face as a sign of their defiance against the government. Prime Minister Erdoğan took offense, telling a rally of his supporters to use only plain flags. It is an overlapping axis of all of these segments of Turkish society coming together . . .
Erdoğan and his Justice and Development Party have set themselves up in opposition to the Kemalist legacy: dismantling the deep state, and challenging major secular industrialists and the military top brass. Indeed, the current government has gone so far as to develop a neo-Ottoman policy – viewing themselves as the model Muslim democracy for a Middle East under the Turkish sphere of influence. They have chosen to emulate Sultan Abdulhamid II (1876-1909), known to history as the ‘Red Sultan’ for his repressive regime and overthrown in a constitutional revolution in 1908. 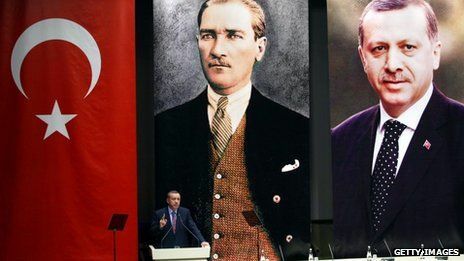 Erdoğan has even proposed using Ottoman symbols; at a pro-government rally in June, while making the case against Ataturk’s portrait on the national flag, Erdoğan encouraged supporters to hang the Ottoman symbol of three crescent moons outside their homes. Many commentators attempt to break down contemporary Turkish politics into simple dichotomies: Islam vs. secularism, rich vs. poor, Kurd vs. Turk, urban vs. rural, military vs. government. However, the turbulent political scene is an overlapping axis of all of these segments of Turkish society coming together and dividing along different lines. There has been some recognition within AKP ranks that this summer’s events were mishandled. A report released in mid-August by the Eurasia Global Research Center, an AKP think tank, characterized the Gezi unrest as a “strategic mistake.”[viii] The report, penned by an AKP deputy, argued that the protests could have been avoided if the situation were better handled by the Istanbul municipality and included community dialogue. While this may be a means to shift blame away from Erdoğan onto lower levels of government, taken at face value it recognizes the importance of the democratic process and the problematic use of force in response to the protests. Additionally, at the opening of the current judicial session in September, the president of the Supreme Court of Appeals warned of the threat of increased authoritarianism to Turkish democracy. At the highest level of Turkish politics the values of democracy are championed. Whether these values will be acted on remains in question. The resistance movement continues to grow in Turkey. 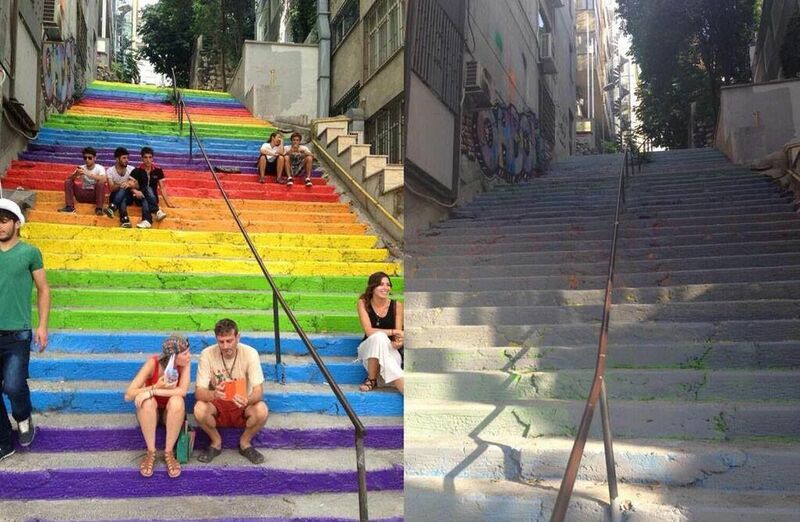 In late August and early September protest actions included a battle with local municipalities to paint public staircases and walkways with rainbows in a symbol of peace and solidarity. Students at Middle East Technical University (ODTÜ) in Ankara, viewed by the government as a stronghold of opposition, have been protesting the building of a multi-lane highway through the middle of their forested campus. The project is seen as a punishment for anti-AKP sentiment. Clashes between students and riot police have led to marches and sit-ins supporting the students in cities around the country. A sixth young protestor was killed in one of these demonstrations. In the first week of October spectators at a soccer game in Izmir province unfurled a banner commemorating the victims of the Gezi protests chanting, “everywhere is Taksim, everywhere is resistance!” On November 1st, 82 university students were expelled from their residences in Samsun on the Black Sea, losing their loans and scholarships for participating in the Gezi protests. 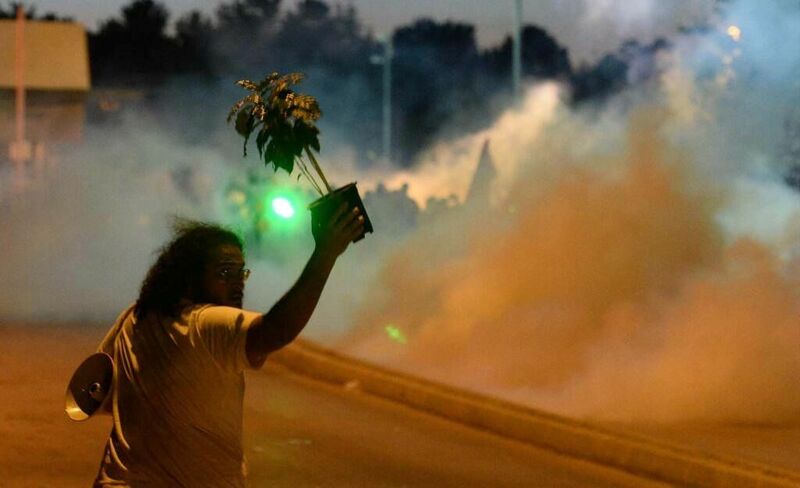 The resistance movement that began in response to the destruction of a park in Istanbul shows no sign of disappearing. The banner of resistance is waved across Turkey for a growing number of social justice causes. “We are demanding reformation of the state-society relationship. But I don’t want it to divide us into two: anti or pro-government,” says Cağla. As Erdoğan and AKP stay entrenched in their position, what remains to be seen is the path Turkey will follow out of this impasse. Will it be one of compromise and democracy at work or a spiraling spate of violence and destruction pitting Turkish citizens against their state and each other? [iv] Gulcan, Emel. “#Resist Press Freedom.” Bianet. 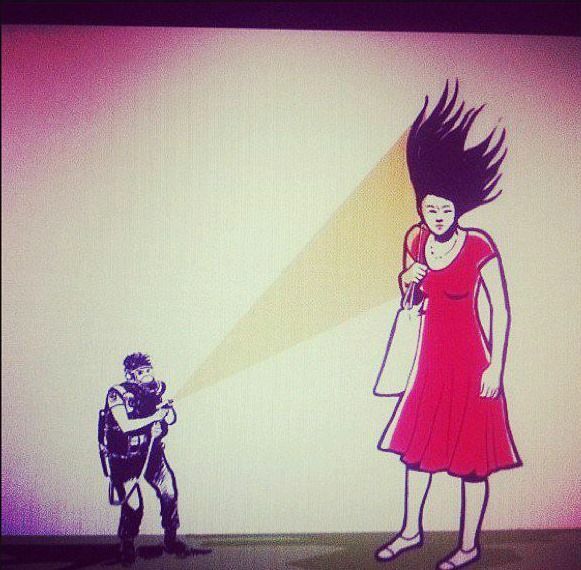 July 24, 2013. http://bianet.org/english/freedom-of-expression/148715-resist-press-freedom. [viii] “Ruling AKP deputy report criticizes government handling of Gezi crisis.” Hurriyet Daily News. 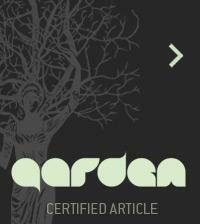 Aug 12, 2013. http://www.hurriyetdailynews.com/TurkRadio.aspx?pageID=238&nID=52419. ZARA RABINOVITCH is a writer, researcher and volunteer program manager for the Society for the Preservation of Wild Culture, and a contributing editor to The Journal of Wild Culture. She holds degrees in Comparative Politics–Nationalism and Ethnicity from the London School of Economics and Political Science, English Literature Minor from the University of British Columbia. She has worked in documentary film production as co-writer and associate producer of The Sultan’s Women, a docudrama portraying the emancipation of women in the Ottoman Empire. What for you . . . what now for us?